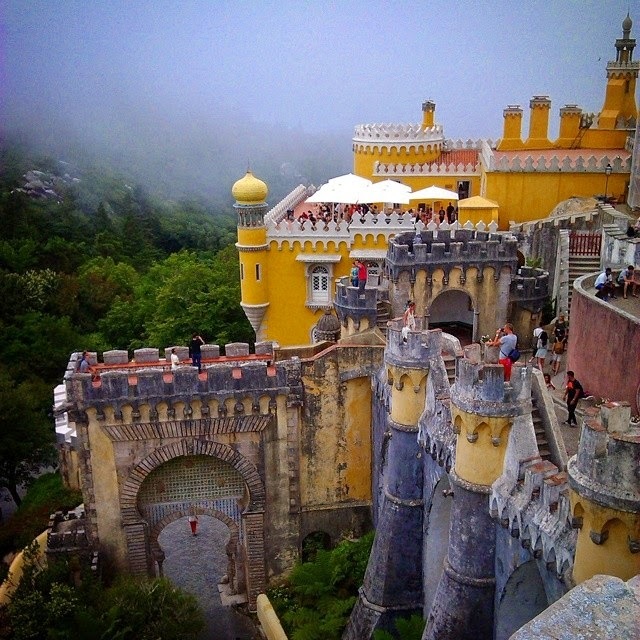 If you see a photo of a monument in Portugal there’s a high chance that it will be of the National Palace of Pena. 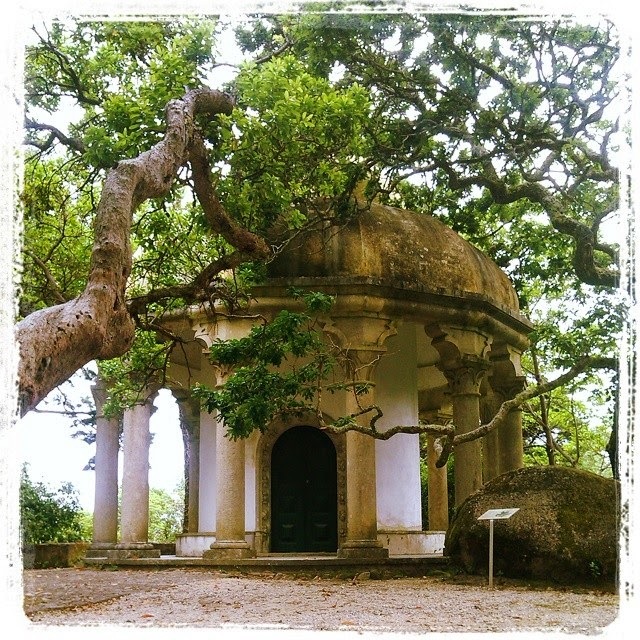 This incredible royal palace sits on a top of a hill in the Sintra Mountains and with its colourful walls and eclectic decoration it looks like a huge fairy castle. I remember looking at it the first time and asking ‘who could possibly dream up something so crazy as this?!’. And I hadn’t even seen it then from the inside! Originally a tiny little chapel for Our Lady of Pena it was a pilgrimage site, even for many royal members. King Manuel I. had liked the place so much that he ordered a monastery to be built there – which was later completely destroyed by the 1755 earthquake. It took almost a century for somebody to take notice of the place but when they did, they didn’t skimp. King Ferdinand bought the ruins of the monastery, the nearby Moorish Castle and a few more estates around, just to make sure, then ordered a palace to be built and turned it into a royal summer getaway for the Portuguese royal family. A kind of Portuguese Windsor, if you like. I was right when I thought that the architectural style must be eclectic, it was built in Neo-Gothic, Neo-Manueline, Neo-Islamic and Neo-Renaissance with a lot of symbolism thrown in. Have a look at some of the details of the palace walls. Unfortunately the weather wasn’t the best and there was a low cloud hanging around the palace. Due to this we couldn’t appreciate the views as much however it also added to the place’s mystery. The view of the Moorish Castle from the Palace. As the palace was used by the royal family, its last queen, Queen Amélia lived here until her last day before her exile. 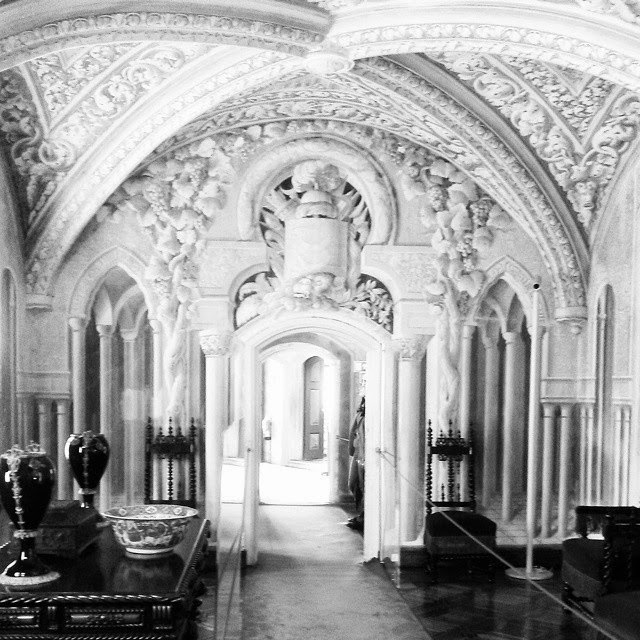 The Portuguese State bought the building and thankfully left everything as it was in the time of the royals. Almost every room here is arranged so that it’s easy to imagine that the residents just popped out for something and will be back at any time. The decoration inside seems as eclectic as outside, every room has a different style. Not to mention all the random objects that have been accumulated there! My personal favourite is the sun cannon on the Queen’s Terrace. 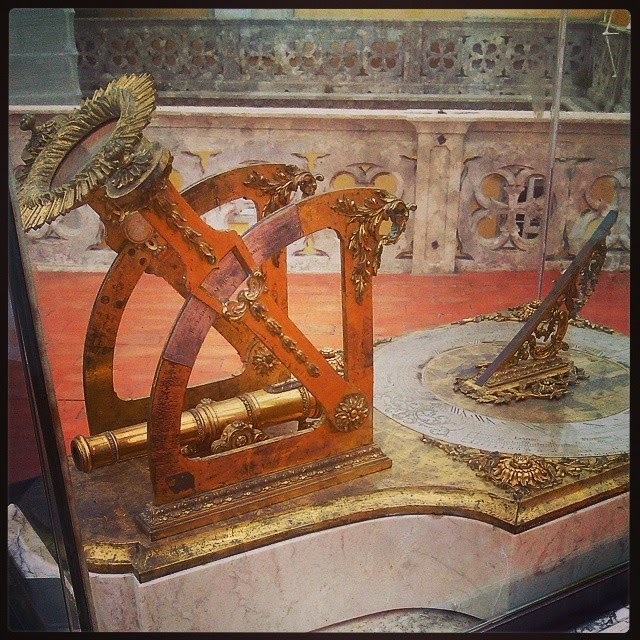 Every day the sun would ignite the gunpowder through the magnifying glass which would fire the cannon exactly at noon. How cute! After spending hours wandering around the palace and marvelling at its beauty, you still have the Park to explore. Together with your ticket you get a map as well, so you can pick and choose the places you’d like to see. Here are some of the details. 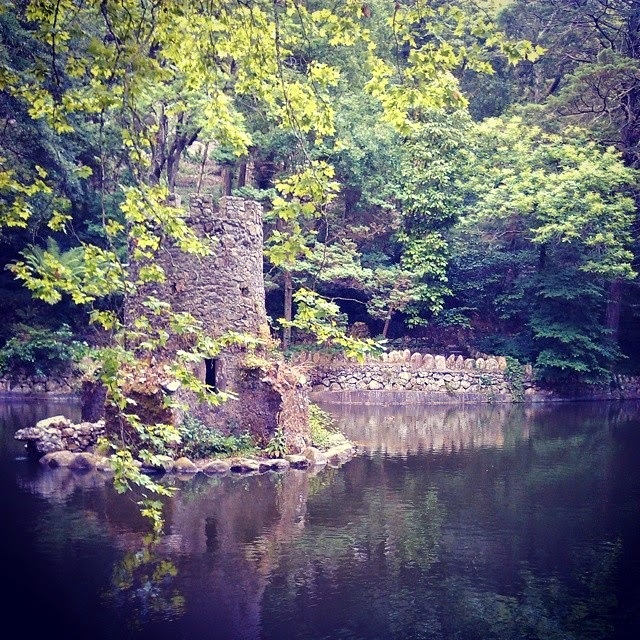 This was our favourite, a surprised little castle on the water. The Palace is a national monument and a UNESCO Word Heritage Site, also one of the Seven Wonders of Portugal. It is still used on occasion by the President of the country. I strongly suggest visiting it if you have time, however there are a few things to consider before you set out. It is possible to drive up to the entrance. There are many parking places on the side of the road and there are even frequently updated signs to tell you the amount of parking spaces further ahead which is quite helpful but we hadn’t known about at the time. If you don’t want to drive you can take the bus 454 which starts at the train station in Sintra and stops in front of all the monuments. The entry fee is quite pricey, 14 euros (full price) and it gives you an entrance to the Palace and the Park. You can buy combined tickets as well with other monuments to save some money. From the ticket office the Palace itself is quite a way away and there’s an option to take a shuttle bus for an extra 3 euros. We didn’t pay for it and I personally think that it’s not that much of an effort. They claim that it’s a 15 min steep climb but unless you have kids or of age you should save that 3 euros for a coffee on the terrace of the palace. If you need more information check out the official website here.